Resolve Optics reports on how its high bandwidth video teleconferencing facility has improved its OEM lens design and development service. Mark Pontin, Managing Director of Resolve Optics commented “We invested in video teleconferencing to improve and enhance communications with our customers around the world”. He added “We have found it has provided many more benefits to both our customers and ourselves. 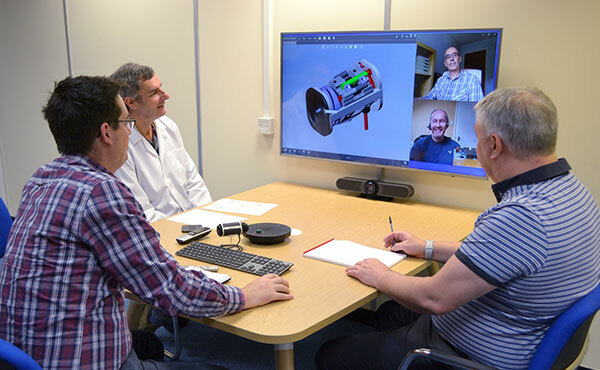 Being able to share and discuss a 3D CAD image of a prototype lens design with participants in different locations has enabled us to accelerate development. A telephone discussion would not have been able to deliver the same benefits. Likewise, we have also been able to use the teleconferencing facility to troubleshoot and quickly solve questions customers have had on delivered lenses. All in all it has been a great asset enabling us to further improve the service we are able to provide our OEM lens design, development and manufacture customers”. For further information on OEM lens design, development and manufacture please visit https://www.resolveoptics.com/oem-design-manufacture/ or contact Resolve Optics on +44-1494-777100 / sales@resolveoptics.com.